This might be my worst nightmare. Best of luck to you. Congratulations! And good work by your children for finding you the YouTube videos. Your crabs are lucky to have you, and you and your students will enjoy them. Topic: do your crabs seem to enjoy watching you? Re: do your crabs seem to enjoy watching you? Mine seem to enjoy watching the events in ApartmentLand. I think of it as environmental enrichment. Topic: Axolotls and Hermit Crabs in the same room? Re: Axolotls and Hermit Crabs in the same room? A less expensive alternative to chillers, depending on your ambient temperature, is to hang fans above the tank. Increased evaporation cools down the temperature. Again, whether this works depends on how hot your apartment gets. Topic: I GOT MY LEOPARD GECKO!! Re: I GOT MY LEOPARD GECKO!! Leopard geckos are marvelous. Congratulations on your new animal friend. I look forward to those photos when you were able to post. 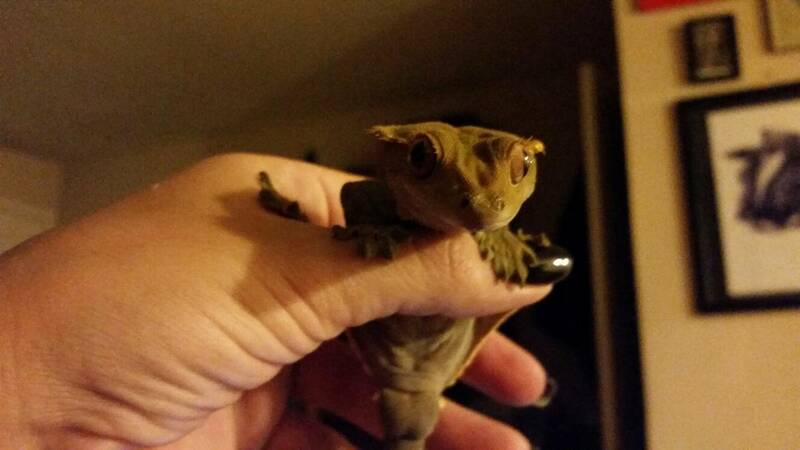 Topic: Crested gecko and new enclosure! Re: Crested gecko and new enclosure! Your little one is adorable! Great work on the tank. Well done! Those turtles look so happy. Topic: All my danger noodles. Re: All my danger noodles.